By embracing End-User-Experience (EUE) measurements as a key vehicle for demonstrating productivity, you build trust with your constituents in a very tangible way. The translation of IT metrics into business value is what APM is all about. 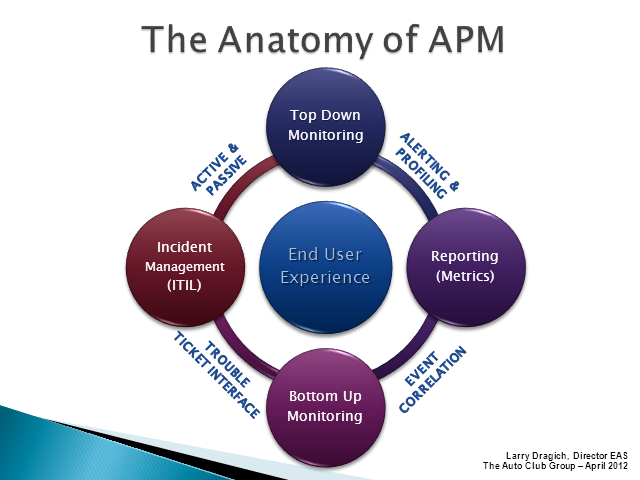 Join Larry Dragich, Director of Enterprise Application Services at The Auto Club Group (AAA) in this high-level webinar as he reveals the success factors in APM adoption center around the EUE and the integration touch points with the Incident Management process. Larry is actively involved with industry leaders sharing knowledge of APM technologies from best practices, technical workflows, to resource allocation and approaches for implementation of APM Strategies. He is also a contributing editor on Wikipedia focused on defining the APM space and how it ties into the critical ITIL processes many companies are now using.